(Editor’s note: 1/14/19) As an update to the original blog post, we wanted to clarify a few points on the science involved in the integration. Our science and research teams recognize that the data related to how genetics interacts with diet is still being understood, and this program is not intended to suggest a specific diet based solely on one’s genetic information. 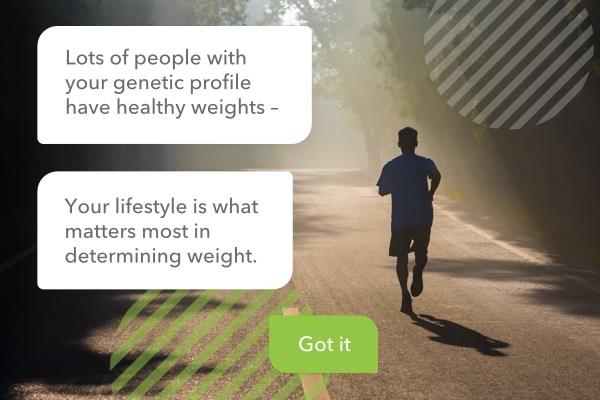 Rather, by integrating information from 23andMe into Lark’s proven and peer-reviewed AI coaching programs for diabetes prevention and weight loss, there is simply an added layer of personalization for customers. The integration uses information from a number of reports already available to 23andMe customers, including Genetic Weight, Saturated Fat and Weight, Lactose Intolerance, Caffeine Consumption, Deep Sleep, Sleep Movement, Bitter Taste and Sweet v. Salty Preference. The genetic interpretations presented in the programs are not being used as part of the major decision points in Lark’s recommendations; instead, they serve as triggers or motivators to do things Lark would already suggest. For example, if your 23andMe report says you’re likely to be lactose intolerant, the Lark program might ask you if you would like lactose-free diet recommendations. For additional questions or to connect with a member of our research team, please reach out to lark@23andme.com. Lark offers a new type of coaching program that uses artificial intelligence (AI) to help you make healthy lifestyle choices. Lark provides two options — a Wellness Program, for weight loss, and a CDC-recognized Diabetes Prevention Program. Both leverage your 23andMe genetic information using clinically validated A.I. to generate personalized suggestions for diet and exercise. These digital coaching programs are also 23andMe’s first forays into using genetic data to deliver these kinds of tailored recommendations. They could mark “a turning point for driving more effective behavior change,” said Robert Gabbay, Chief Medical Officer and Senior Vice President at Joslin Diabetes Center in Harvard and Lark Health’s Senior Medical Advisor. So how do you get access to this supportive and personalized coaching to help you reach your day-to-day health goals? While it’s simple enough for 23andMe Health + Ancestry customers to opt into and use the programs, that ease of use belies the sophistication of what’s going on in the background. The programs are personalized by 23andMe research that’s identified not just how genetics can impact weight, but how lifestyle choices — for things like diet, exercise, and sleep — may play a role. The programs also integrate customers’ individual genetic information from several 23andMe weight and diet-related reports into Lark’s A.I. coaching program to serve up tailor-made recommendations for users. And best of all this helpful coach is available every day 24-7. It means that instead of just getting generic advice about eating less and exercising more, the application can, for example, use 23andMe’s Genetic Weight Report to rank the different impacts certain foods may have on an individual’s weight. Or the A.I. coach might make other personalized recommendations that are based on 23andMe reports that look at a person’s response to saturated fat, or lactose or their movement during sleep. And you can get that kind of personal advice any time you need it. The Wellness Program will tap into data from the 23andMe genetic reports, and the A.I. coach will focus on suggestions around nutrition, sleep, and exercise. The program can also seamlessly merge data from more than 70 other types of monitors or apps to incorporate that information that in turn can improve the personalization of the A.I. recommendations. To integrate Lark’s Wellness Program and use it with your 23andMe results, it will cost $19.99 a month. There is now a special introductory offer of just $14.99 per month. The CDC-recognized Diabetes Prevention Program is a yearlong program meant to lower the risk of developing type 2 diabetes. This program includes specialized coaching, a digital scale, and a Fitbit, and some insurance providers cover it. You can find out if you are eligible by downloading Lark and taking a survey. For those who do not qualify for insurance coverage, they can still self-pay for the Diabetes Prevention Program. The price for this self-pay option includes a digital scale but not a Fitbit. Taken together these two new programs are an exciting opportunity for 23andMe Health + Ancestry customers. This is not just because these programs can help nudge people toward their health goals, but also because they offer an actionable way for customers to use their genetic results to make lifestyle changes, something customers tell us they want. 23andMe Health + Ancestry customers can learn more and connect their account to Lark here. Not yet a 23andMe Health + Ancestry customer, but you want to take this next step? Find out more here.